For many years, your landline telephone would allow you to stay connected to emergency voice services during a power outage. However, if your residential voice telephone service is provided using fiber optics, fixed wireless, or by coaxial cable, rather than the traditional twisted pair copper based line, the residential voice telephone service requires backup battery power to continue functioning during a power outage. To avoid a disruption of home voice service during a power outage - and to maintain the ability to connect to 911 emergency services -- Citizens provides you with a battery for backup power for your residential voice telephone service at the time of the initial installation at no additional cost. The backup battery for voice service provided by Citizens allows you to continue to use your home voice services during a power outage. Without a backup battery or alternate back up source such as a generator, customers with fiber, fixed wireless or coaxial cable delivered services will not be able to make calls, including emergency calls to 911. The only way to maintain the ability to use your voice service is by using some form of backup power. Citizens’ backup battery only provides backup power to Citizens voice services. Devices that rely on voice service, such as home security systems, medical monitoring devices, TTY devices, and other equipment may be disrupted if there is an electrical power outage unless those devices are powered by an alternate power source such as a generator or UPS (Uninterruptible Power Supply). These type of alternate power sources are available from third party retail vendors. The backup battery included with your Citizens’ voice service modem is expected to last up to 8 hours on standby power. The backup battery should give you approximately 4 to 6 hours of talk time. If you require a backup battery with a longer standby and talk time, please contact us. We offer batteries with up to a 24 hour standby time. 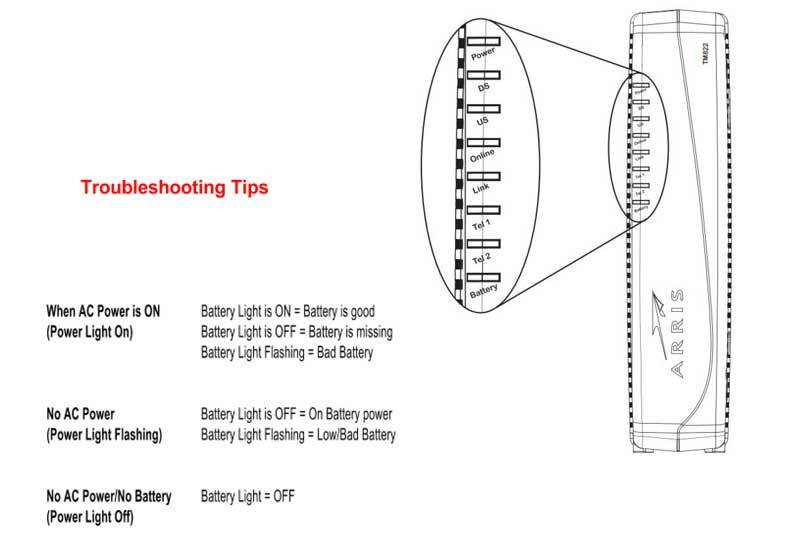 Please follow the more detailed instructions included with your battery for proper use, storage and care of your battery to ensure that it will function as needed during a power outage. If you do not store your battery correctly, it may shorten its useful life. Environmental factors such as temperature can shorten your battery’s useful life. We recommend that your voice service modem with battery backup be operated in temperatures above 32°F and below 122°F. Citizens’ backup batteries are rechargeable and have an estimated useful life span of 3-5 years. Please see diagram below and promptly notify us if the Battery Light indicates a Missing, Low, or Bad Battery. Citizens will provide and install at no cost to you, a replacement backup battery, upon appointment, when you let us know that the battery needs to be replaced. If you have any questions, please call 540.745.2111 or 276.637.6485, or email customercare@citizens.coop.